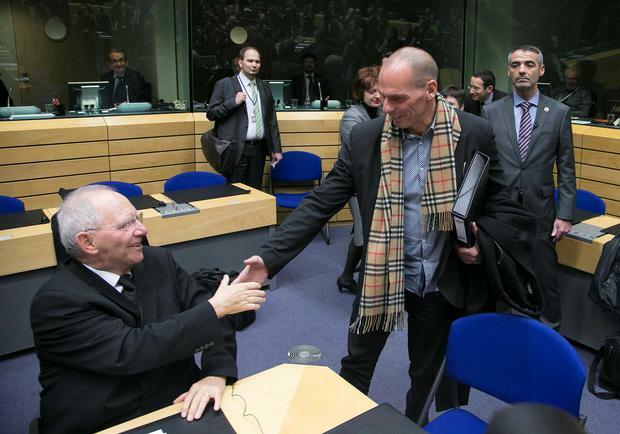 Greek Finance Minister Yanis Varoufakis (R) shakes hands with his German counterpart Wolfgang Schaueble (L) at an extraordinary euro zone Finance Ministers meeting to discuss Athens' plans to reverse austerity measures agreed as part of its bailout, in Brussels February 11, 2015. German Finance Minister Wolfgang Schaeuble criticised the Greek government on Wednesday for doing nothing but renege on previous commitments since coming to power, saying the situation had "worsened dramatically" under Prime Minister Alexis Tsipras. "This government has done nothing since it came into office," Schaeuble said in a speech in the lower house of parliament. "It has only reversed measures. It reneged on previously agreed commitments. It negotiated and negotiated. We don't know if the Greek government is going to hold a referendum or not, whether it is for or against it. You can't in all honesty expect us to talk with them in a situation like this. We need to wait to see what happens in Greece." His comments came as Greece did a u-turn and accepted earlier bailout conditions, with a few concessions, from a June 28 offer. However, it is understood that no deal will be done ahead of a referendum in Greece next Sunday on the acceptance of bailout conditions, that have now expired. The country also defaulted on a €1.6bn loan repayment to the IMF at midnight last night.